Leo’s Pad is making quite a name for itself in the edu-app world with the series’ scientific spin on early education. Leo’s Birthday Card Maker features an interactive tool from the popular appisodes, and the best part is that it’s our Free App of the Day. Keep an eye out for our review of the third appisode Catch That Question – coming later today! NEW, from the makers of Leo’s Pad (the AWARD-WINNING app that is both FUN and EDUCATIONAL)! Take Leo to your iPhones and iPods! ==>MAKE and SEND birthday cards more easily than ever! ==>Leo’s Birthday Card Maker will help young learners explore their artistic talents and learn colors in a fun and collaborative way! ==> A beautiful, interactive way to paint and decorate, designed by Stanford University education researchers in conjunction with Emmy Award-winning animators! In Leo’s Birthday Card Maker, your kids can create and decorate personalized birthday cards for their family and friends. And they can save their work for further sharing! Kids will work on their designs with Leo encouraging them in the background and helping with color recognition. 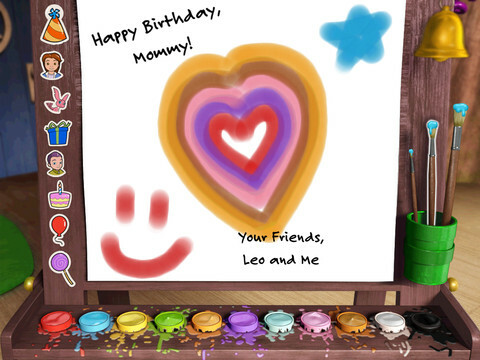 Leo’s Birthday Card Maker maintains the same high quality graphics standards found in Leo’s Pad on the iPad! Kids will find the visuals and animations both stunning and immersive. Leo’s Birthday Card Maker allows kids to easily save cards to the device for easy emailing or printing.